In 1830 the beautiful Tasman Peninsula was chosen by Governor Arthur as the site for a penal colony to house Britain's worst offenders. It was considered an excellent location for a prison because the narrow isthmus at Eaglehawk Neck connecting the Tasman to the mainland acted as a natural barrier. As a centre of industry with fine buildings, shipping, mining and milling, Port Arthur was much more than a convict station. Nonetheless, it's difficult to imagine how tough life must have been here in the 1800s, especially considering the breathtaking beauty of the surrounding landscape on the peninsula. 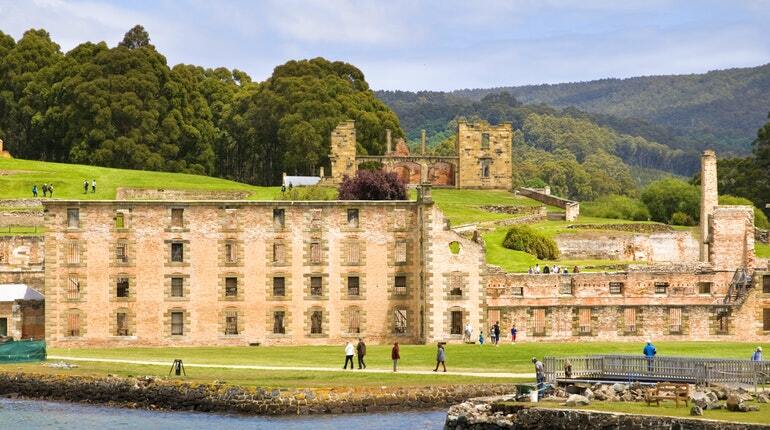 Today there are numerous things to do at Port Arthur, which help make it one of Tasmania's premier tourist attractions. Your entry pass allows access to the interpretation centre, a guided walk and 25-minute harbour cruise. On top of this, you will have access to more than 30 historical buildings, ruins and gardens. Port Arthur Cruises also operate tours further afield and Tasmanian Seaplanes have flights over the region. Port Arthur is located on more than 40 hectares of land, so make sure you wear comfortable walking shoes. Most of the historic site is outside, therefore you will need weather appropriate clothes, including a raincoat, sunscreen and a hat.